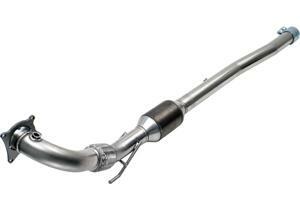 NEUSPEED Downpipe - Pann Auto Performance - San Diego largest aftermarket automotive performance parts - What do you drive? NEUSPEED has improved on the factory down-pipe by eliminating the “S” bend to a more flowing design, and enlarged the pipe to 60.0mm. The NEUSPEED hi-flo down-pipe is all stainless steel: flange, pipe and flex-joint. The flex joint also has a smooth inner liner to cover the bellows as part of our engineered hi-flo design. Includes turbo-to-downpipe gasket. You will need to cut off the stock down-pipe, and weld the end of the NEUSPEED down-pipe to the catalytic converter – same as stock set-up. Fits all FWD Golf IV, Jetta IV, Beetle, 180hp Audi TT 1.8T engines.